1: Rocket launches in 51's coverage during this year's World Series. It was covered live in Trackside Now, marking our first space-related coverage in our history. 2: 2014 was the second-straight year that Speed51.com provided the live NASCAR Home Tracks Race Central Live coverage of the UNOH Battle at the Beach at Daytona International Speedway. 3: Speed51.com's staff provided live updates, via either Trackside Now coverage or our AP Racing Brakes Twitter Feed, from three different tracks during Speedweeks (Daytona, New Smyrna, Volusia). 4: Number of nights of live radio in conjunction with our Trackside Now coverage. 7: 2014 market the seventh year of live Trackside Now coverage of the World Series of Asphalt Stock Car Racing on Speed51.com. 14: Number of staff members on the 51 team during the week. 33: Number of races covered on Trackside Now. 44: The only number that 51 team was thinking about after the race. HT's Pub 44 is the official food sponsor for Speed51.com at Florida Speedweeks. 52: Fans from all 50 states plus the District of Columbia and Canada viewed Speed51.com's Trackside Now pages during the live coverage days. 128: number of Hours of Trackside Now and our live coverage 51 presented fans with. 268: The total number of Gigabytes (GB) of photos taken by Speed51.com's photographers during Speedweeks. 10,000: Our AP Brakes Twitter feed passed 10,000 followers during Speedweeks. 32,000: Our Five Star Race Car Bodies Facebook page passed 32,000 "Likes" during the Florida Speedweeks coverage. 200,000: Nearly 200,000 short track racing fans tuned into 51's Trackside Now coverage over the 10 days of live coverage during this year's Florida Speedweeks. 0: Venturini Motorsports had four fast racecars in Daytona, but none of them finished in the top-10 at the checkered flag. Due to incidents on track some of the team cars failed to finish, while John Wes Townley led the VMS brigade with an 11th-place finish. 1: Starting spot for Dylan Kwasniewski in both the ARCA race and the Nationwide race later in the week. 3: Daytona was the third career win for Grant Enfinger. 4: Laps led by Canadian Maryeve Dufault. They were her first four laps led in ARCA competition. 5: Five ARCA teams had tech issues following qualifying. 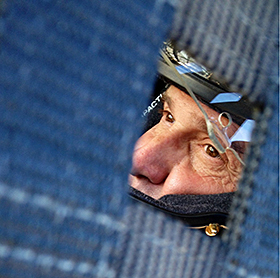 8: Number of times Frank Kimmel has finished in the top five at Daytona, but he still has zero wins. 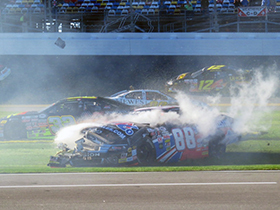 8: Number of cars that were taken out of contention in the biggest incident of the race, a lap-12 melee off turn four. 16: Number of cars that finished on the lead lap. Ironically it was the same as 2013.
attempting the event. Daytona was the only event Self could not compete in before his 18th birthday in March. 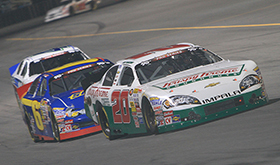 20: The number of the racecar started by Spencer Gallagher in the race. Gallagher's car was disqualified in post-qualifying tech for a mechanical lowering device, but he arranged to run his teammate Scott Sheldon's car, which locked in on time, in the race. 32: Starting spot for Tyler Reddick, who came home fifth. 54: The age of third-place finisher Clay Campbell, who spends his days as the President of Martinsville Speedway (VA). 80: Number of laps in the ARCA race at Daytona. 2:58: The time on the clock it took for ARCA qualifying tech to finish at Daytona. Speed51.com was on top the story from the first minute to the final. 1: The UNOH Battle at the Beach NASCAR Whelen Modified Tour event was Doug Coby's first behind the wheel of the Mike Smeriglio-owned No. 2 car. In his first start, he went to victory lane. 2: Tuesday's NASCAR K&N Pro Series East event at Daytona was Daniel Suarez' second-straight win, following up his season-opening victory two days earlier at New Smyrna. 2: Bill McAnally Racing put two cars in the top-four finishing spots at Daytona with Brandon McReynolds finishing third and rookie Nick Drake in fourth. 2.5: The average finish for Doug Coby over two seasons at Daytona. He was the winner this year and was fourth a year ago. 3: Of the top-five finishers, three were entries from the NASCAR Whelen Southern Modified Tour (Jason Myers, Luke Fleming, Burt Myers). 4: The number of drivers who finished in the top 10 of both season-opening Florida K&N Pro Series East races between New Smyrna and the Battle at the Beach (Daniel Suarez, Lee Pulliam, Kenzie Ruston, Gray Gaulding). 7: Sixteen-year-old Kyle Benjamin made his first-ever Modified start in the Battle, driving Kevin "Bono" Manion's No. 7NY. Benjamin suffered a mechanical issue and finished 20th. 8: There were only eight cautions in the Modified portion of the Battle at the Beach this year, down significantly from the 17 that plagued the first Battle in 2013. 11: The number that two-time NASCAR Whelen All American Series Champion Lee Pulliam is driving in the NASCAR K&N Pro Series East this year. Some might have figured he'd be a slow learner coming from Late Models, but two races in and he had two top fives and is second in points. 19: Starting spot for Brandon McReynolds in the K&N event at Daytona. He finished third. 20: Gray Gaulding, driving car No. 20, was the only driver to finish in the top 10 in the two editions of the Battle at the Beach K&N events. 21: Ben Rhodes picked up his first 21 Means 21 Pole Award in qualifying for the K&N Pro Series East event. He finished 15th after suffering damage in the race. 119: Number of laps Daniel Suarez led in the K&N East race. 147: Number of laps Ryan Preece led in the Modified race before tangling with a lap car. Preece ended up fourth in a heartbreaking end to the race. 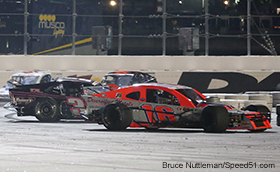 0: Two of the most successful Modified racers of 2013 were held without victories during the Smyrna World Series. Ryan Preece, the 2013 NASCAR Whelen Modified Tour Champion and Matt Hirschman, a winner of 20 Modified events last year, both went winless. 2: Number of first-time winners in the Pro Late Model division. Spencer Davis and Harrison Burton both became first-time World Series winners in the division. 5: Number of Pro Late Model wins for Brad May over the last two years at the World Series with no championships. This is the most all-time in the Pro Late Model division. 7: Only seven of the 30 drivers that started the NASCAR K&N Pro Series East race at New Smyrna on February 16 during World Series opening weekend had experience at the track previously. The race was won by Daniel Suarez, who had not raced there previously. Brandon Jones, who raced at the World Series in the Pro Truck division several years ago, led the Smyrna-experienced drivers with his third-place finish. 8: Total years that the Pro Late Model division has been going and without a repeat champion. 13: Number of years with no repeat champion in the Super Late Model division. 13: The age of Harrison Burton, who became the third 13-year-old to win in the Pro Late Model division. Logan Ruffin and Stephen Nasse were the other two. 28: Number of years they have run the Richie Evans Memorial at New Smyrna and Justin Bonsignore became the 22nd different winner of the event. 37: New Smyrna Speedway track photographer Jim Jones celebrated his 37th year of shooting the World Series in 2014. 42: Number of Florida/IMCA Modified wins for Jerry Symons, who trails only Ted Christopher with 52 wins over threes division. 46: The approximate number of hours in between the checkered flag falling on the first NASCAR K&N Pro Series East race at New Smyrna Speedway and track owner Robert Hart signing an agreement with NASCAR to hold another event at New Smyrna in 2015. 66: The car number for Steve Wallace who won the Super Late Model title, yet another thing he can joke about with his dad. Steve has now won a New Smyrna title in addition to a win in the Snowball Derby, two accomplishments his legendary dad Rusty never earned. 222: Cars that Raced at New Smyrna over the eight nights of action. 1350: The approximate mileage between New Smyrna and Middlebury, Vermont, the hometown of Florida/IMCA World Series Champion Todd Stone. 3: Ty Dillon wins in the Gator Championships for the third time in his career. His older brother Austin Dillon has also won the event once. 5: Number of wins for the Dillon brothers with Ty taking four and the title and Austin taking one win. 14.8018: The new East Bay track record set by Keith Nosbisch in Crate Late Model action. 10-21: Dates for the Dirt Car Nationals in February of 2015. 11: The starting spot for Donny Schatz in the World of Outlaws event at Volusia, where he charged to the front to win the 30-lap A main. 17: The position that Kenny Wallace finished in the night he rolled over at Volusia. Speed51.com was there tweeting about the race and got this photo to the right. 23: The age of Kyle Bronson who had the upset win on the final night at Volusia in World of Outlaw Late Model action. 26: The career win number for Bryan Clauson after he captured the 30-lap win on the final night of racing at Bubba Raceway Park. 49: The lap number when Casey Roberts passed Scott Bloomquist for a $10,000 win at Volusia on February 20th. 50: The age of Scott Bloomquist when he won at Volusia last Wednesday night. 63: Number of UMP Dirt Modifieds that ran a t Volusia over the week. $12,650: The Money that Darrell Lanigan took home on February 16th at Bubba Raceway in World of Outlaws action. Ryan Preece (16) was dominant in the Modified Battle at the Beach before tangling with the lapped car of Dave Sapienza (36).